When you look at pictures of yourself or at yourself in the mirror, are you distracted by flaws in your teeth? Perhaps you have multiple flaws in the same teeth and think it would take several long, complicated procedures to address. It can be frustrating and maybe even cause you to hide your smile. Well, here at Corbin Family Dental Care, we offer a solution that can take care of them all at once—porcelain veneers. Whether you just treat one tooth or all your visible teeth, this tried-and-true cosmetic option can completely transform and revitalize your smile and your confidence. Stains that don’t respond to professional whitening. Slight misalignments in the teeth. When porcelain veneers are applied, these flaws immediately vanish, showing only a stunning smile that stands out in the best possible way. They look completely natural. Because veneers reflect light just like enamel, no one will be able to tell that they’re there. They are durable. 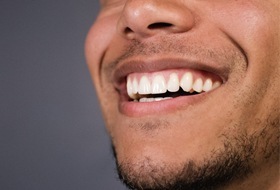 Veneers can handle the normal wear and tear you put them through. They are stain resistant. In fact, they are better at repelling stains than tooth enamel. They are versatile. They can correct several kinds of flaws simultaneously. They are biocompatible. Porcelain veneers shouldn’t irritate your gums and should feel perfectly comfortable in your mouth. 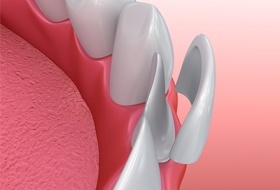 She will remove a small part of your teeth’s enamel to make room for the veneers. We will then take impressions of your teeth, which will be sent to a dental lab and used to create your custom veneers. Before you leave, Dr. Whitaker will adhere temporary veneers to your teeth. When the final products are ready, you’ll return to our office so she can permanently place the veneers, instantly improving the appearance of your smile. In as few as two simple appointments, you could have the smile you’ve always wanted! As with many other cosmetic dental procedures, you need to be in good oral health to be eligible for porcelain veneers. But the only way to know for sure whether you qualify for this transformative cosmetic option is to talk to Dr. Whitaker so that she can evaluate your specific case. Then together you can create a personalized treatment plan to meet your needs. At Corbin Family Dental Care, we want you to enjoy a happy, confident smile as well as a healthy one. Our experienced, compassionate team is committed to helping you reach your smile goals, and porcelain veneers are a great way to do just that. Schedule a consultation with Dr. Whitaker today to discuss your candidacy for porcelain veneers and get started!